Comet McNaught over the Pacific Ocean. Image taken from Paranal Observatory in January 2007. CometMcNaught, the so-called Great Comet of 2007, has beenidentified as the biggest comet measured to date, according to scientists,whose calculations were based on the comet's overall influence in space. Insteadof using the length of the comet's tail to measure the scale of the comet,astronomers used data from the ESA/NASA Ulyssesspacecraft to determine the size of the region of space disturbed by thecomet's presence ? a cosmic wake across the solar system. Throughanalysis of magnetometer data, scientists found evidence of a decayed shockwavesurrounding the comet, which was created when ionized gas emitted from thecomet's nucleus joined the fast-flowing particles of the solar wind. That, inturn, caused the solar wind around the comet to abruptly slow down. Serendipitously,the robotic Ulysses spacecraft made an unexpected crossing of Comet McNaught's tail in 2007, which allowed astronomers tocollect valuable and pertinent data. Ulyssesencountered McNaught's tail of ionized gas downstreamof the comet's nucleus, at a distance of more than 1.5 times the distancebetween the Earth and the sun. That?s about 139 million miles (224 million km).The average distance between the Earth and sun, called 1 astronomical unit, isabout 93 million miles (150 million km). Thiswas far longer than the spectacular dust tail that was visible from Earth in2007. 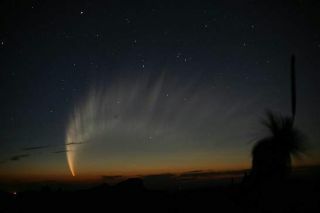 Ulysses'2007 encounter with McNaught was one of threeunplanned encounters that Ulysses made with comet tails during its 19-yearmission, which ended in 2009. The other encounters included CometHyakutake in 1996. Hyakutakeis the current record-holder for the comet with the longest measured tail. Butthe data collected from Ulysses' encounter with McNaughtallowed scientists to gauge the size of that comet. "Itwas very difficult to observe Comet McNaught's plasmatail remotely in comparison with the bright dust tail, so we can't reallyestimate how long it might be," said Dr. Geraint Jones of UniversityCollege London's Mullard Space Science Laboratory,who will present the findings at the Royal Astronomical Society NationalAstronomy Meeting in Glasgow, Scotland, on April 13. "Whatwe can say is that Ulysses took just 2.5 days to traverse the shocked solarwind surrounding Comet Hyakutake, compared to anincredible 18 days in shocked wind surrounding Comet McNaught,"Jones said. "This shows that the comet was not only spectacular from theground, it was a truly immense obstacle to the solar wind." Scientistsalso compared the crossing times for other comet encounters, which furtherrevealed the huge scale of Comet McNaught. The Giottospacecraft's encounter with Comet Grigg-Skjellerup in1992, for example, took less than an hour from one shock crossing to another.Similarly, it took only a few hours to cross the shocked region of the famedHalley's Comet. In2007, the nucleus of Comet McNaught was estimated tobe less than 15 miles (25 km), but Jones used a different measure to calculatethe comet's scale. "Thescale of an active comet depends on the level of outgassingrather than the size of the nucleus," Jones explained. "Comet nucleiaren't necessarily active over their entire surfaces; what we can say is that McNaught's level of gas production was clearly much higherthan that of Hyakutake."